Yesterday was a crap ball of a day. Just woke up in a stanky mood. Proceeded to do jack crappity for the majority of the day. Even stayed home while Mike ran to the gym and ran home. 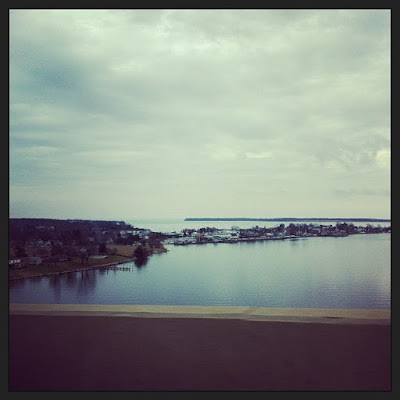 The difference, however, to being in a stanky mood here and being in a stanky mood back where we used to live is that we were able to rally our day by going over the bridge to Solomons Island, enjoying the view, doing some shopping, and having a much needed beer at the brewery. I'm not a big water person, but for some reason once we get over the bridge (I hate bridges...big irrational fear going on there) I just get so happy looking out at the water and the beautiful homes and boats. Walking around, holding hands with Mike, pointing out our dream homes, and finding little restaurants we can't wait to try is the perfect way to rally a stanky mood.